I’m a big fan of participatory live-action storytelling and I’m fascinated by opportunities to blur the line between fiction and “real” experience, creating events where attendees shape the outcome of a story. I went to a Secret Cinema event a few years back and was pretty disappointed – the set design and costumes were fancy, but the opportunities to get involved in the storytelling were minimal. I’d gone to see Casablanca and while it was cool to sing La Marseillaise at a bunch of actors in Nazi uniform, the rest of the “immersive experience” consisted of overpriced snacks and a “casino” barely worthy of a student union’s James Bond night. The Guardian piece captures the extent to which Secret Cinema events are now more about taking your money than letting you step into the world of a story. Over in the US, Library Journal has just published a piece on a project which I helped to launch in the Australian town of Parkes last year. You can read “Coffee Cup Stories” at the Library Journal website. 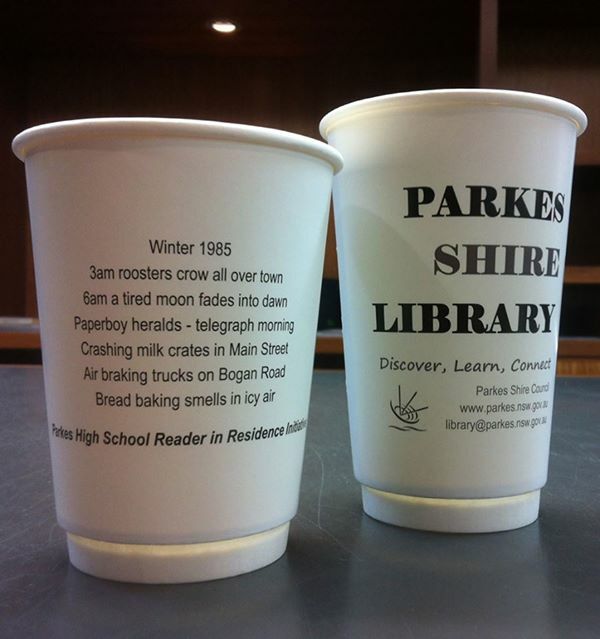 Working with Parkes High School and Parkes Shire Council, our team arranged for local writers’ stories to be printed on takeaway cups used by cafés and venues throughout the town. This empowered local voices and gave people who might never enter the library a chance to enjoy new writing by their own community. Locals and out-of-towners all got a hit of Parkes’ literary scene with every drink they bought. This was part of my role as the town’s Reader-in-Residence. You can see TV news coverage of the project at the Prime7 website. Our coffee cup stories chimed with the values of the ongoing Fun Palaces project, launched last year. Fun Palaces aim to give local communities a chance to take part in the arts and sciences. Parkes hosted Australia’s first ever Fun Palace last year, to great success. 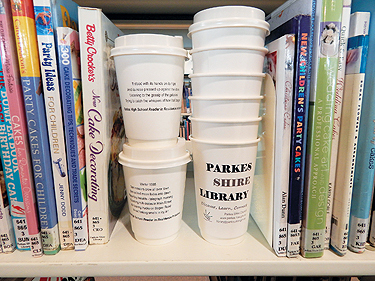 Parkes High School librarian Tracy Dawson has the full coffee cup story over at Library Journal. You can also read Queensland librarian Alison Miles writing about this and other “locative literature” projects which blend place and narrative, at her blog reading360. I was trying to find the words to look back on an eventful season with Parkes Shire Libraries, culminating in this year’s Australian national award for innovation in library youth services. I could have talked about how the country stereotypes have yielded to reveal a town of tough and funny and mad and passionate people. I could have recounted how all the amazing things we’ve done were really about a community that was ready for change, and a bunch of smart librarians who recognised that fact, and who drafted in an outsider to provoke and support and sustain that change. Instead, I wanted the last word to come from someone else. One of our local writers, but one who – like me – came to Parkes a stranger and a foreigner. Santhoshi Chander of the town writers’ group Author-rised kindly allowed me to share her thoughts about the experience of finding a new home out in the Aussie regions. “Ex-city-slicker” San divides her time between Sydney and Parkes. It seemed from the beginning the stakes were against us. I’m not claiming our story has Romeo and Juliet status. But in our own way, we started as star crossed lovers. Parkes High School’s teacher librarian Tracy Dawson has an article in the latest SCAN magazine about the Reader-in-Residence role which I held in Parkes across late 2013 and early 2014. The role was designed to link the school and wider community in a celebration of storytelling, literacy, and culture in all its forms. Events included teen publishing workshops, our biggest ever zombie roleplay, urban myth writing, and the inaugural Central West Comics Fest, which will be returning in 2015. I also mentored high school students, led sessions for the Parkes writers’ group, and worked with the school’s special needs unit. Tracy gives a teacher’s perspective on how trying new things, pushing boundaries, and reaching out to a wider community also yielded great benefits to students at the high school. You can also read her guest posts on this site about Auckland’s XXUnmasked project and the work of a teacher librarian. SCAN magazine is a refereed journal published by the New South Wales Department of Education, focussed “on the interaction between information in a digital age and effective student learning.” You have to subscribe for recent issues, but the archive is publicly available – I’ll let readers know when the current issue moves into the free archive. My friends and clients at Parkes Library are having a big week on the Internet. I’ve collected some of the various links in this blog post. Our “Tabletop Superheroes” game devised for October’s Fun Palaces weekend is now available for free download. A remix of Cory Doctorow’s article ‘DMing for your toddler’, it was featured by Cory on BoingBoing. There’s also a blog post about the game at the State Library of New South Wales website. Over at Library as Incubator, you can read Tracie Mauro and Shellie Buckle’s account of running Australia’s first ever Fun Palace. Meanwhile at Zoe Toft’s Playing By The Book site, Tracie is interviewed by Zoe about the “Wonder-based library programmes” she creates for children and families. Tracie explains how you can create similar activities at home, school, or your own local library. The Parkes team are among the most daring and resourceful librarians I’ve ever worked with – no project daunts them, from live action zombies to wading through chocolate pudding swamps. Stay tuned, because there’s much more to come from these amazing Australians. I was sad not to be able to attend the Regional Arts Summit in Kalgoorlie, Western Australia this year – despite best efforts, we couldn’t square it with all the projects currently on the go at Parkes Library. Earlier this year, I was privileged to keynote at VALA, the biennial culture, libraries, and tech conference which took place in Melbourne. I spoke about opportunity and equity in Australian libraries, trading my Hugo Boss for a miner’s uniform on stage to make a point about arts access outside Australia’s big cities. Working in Parkes has opened my eyes to the challenges that rural, regional, and marginal communities in Australia still face in gaining access to arts and culture – both as audiences, and as creators in their own right. In Parkes, we’ve designed events like the Central West Comics Fest to reach out beyond an arts-event circuit that focusses on state capitals, and give regional creators, fans, and audiences their due. Some of the Twitter coverage from Kalgoorlie was relevant to this work in Australian regional libraries, especially contributions from Curtin University librarian Teresa Bennett – @kalgrl on Twitter. Difference between passive consumer and active participant. Huge. You can find out more by checking out the #RAASummit hashtag on Twitter, listening to summit coverage on ABC Radio National, and visiting the Regional Arts Summit site. You can read text based on my VALA keynote here and watch a video of the presentation by entering your email at the VALA website. The Regional Arts Summit in 2016 will take place in Dubbo, just down the road from my friends at Parkes Library. It’s going to be a great time for Central West New South Wales. I look forward to seeing an Australia where the culture scene goes further in embracing the sharp edges and strange delights of life at the margins. We’ve had an amazing start to the Fun Palaces weekend here in rural Australia. So far, since our doors opened, over 260 people have come to try their hand at the challenges we devised together with local kids. That’s great numbers for a small rural community. To see how we got to this point, check out the previous posts on making games with your community and adapting tabletop roleplay for your library. You can check out pictures from today at Parkes Library’s Instagram account…and there’ll be more from Australia’s first Fun Palace tomorrow! It’s been another busy week out here in Central West New South Wales. On Monday, I interviewed the Australian comics creator Pat Grant for the New South Wales Writers’ Centre. You can read Pat’s comics Blue and Toormina Video online. Pat and I will both be teaching courses at the Centre later this year – Pat’s on Graphic Storytelling and mine on Storytelling for a 21st Century Audience. Talking to Pat was timely, because I’d just arranged for Sydney’s superlative comic store Kings Comics to send our local library a vast selection of comics on sale-or-return, which we then allowed the public to choose from in a series of all-ages workshops which I ran to determine our new collection. (Kings mistook me for Doctor Who, too, which only endeared them to me more). Tuesday saw the kick-off of Time Travel Detectives, an immersive role-play programme for 5-12 year olds which invited local children to enter the Parkes Library Time Travel Lab and venture back to 1873 to prevent a time-lost Justin Bieber and his strange minion creatures from changing history and taking over the town.